The Elder Scrolls MMO was originally planned to be PC-only, until Sony pushed for a console version. If you're planning on picking up Bethesda's new Elder Scrolls MMO: The Elder Scrolls Online, for PS4 or Xbox One, you might want to tip your hat in Sony's direction, as if it wasn't for its intervention, the title may have been PC only. SCEA VP Adam Boyes told IGN that the game "was never planned to come to console" until Sony pitched Bethesda on making the jump to the PlayStation 4. "We just kept kind of sitting with them and being like, 'Well, why not?...Why don't you do this?'" explained Boyes, claiming that his insistence lead Bethesda to reconsider console version of the game. Boyes said that he actually pitched his own plan on how to bring the game to consoles, and Bethesda were willing to entertain him. Boyes absolutely loves MMOs and The Elder Scrolls, and his enthusiasm for the game was so contagious that it wasn't long before all parties involved were on board. "Knowing that a game is coming to console that was never going to come to console, that's the kind of stuff that is like, 'Yes!' You know, hugely awesome," Boyes says. 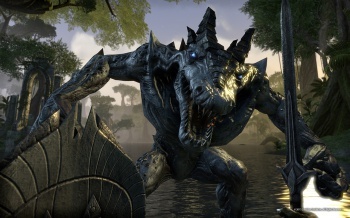 The Elder Scrolls Online, was recently revealed to have a monthly subscription fee, making it one of the very few MMOs, including Blizzard's World of Warcraft that charge a monthly fee on top of the cost of the base game. Are you going to get into The Elder Scrolls Online, and if so, what will be your platform of choice? Personally, I can't really see myself playing an MMO on anything other than a PC anyway, but I'm sure some of you will jump at a PS4 or Xbox One version.